Greg Maddux was the premier pitcher of the 1990s, winning more games than any other player on the mound during the decade. His expert command of his pitches made him a fan favorite with Chicago Cubs backers, and he helped the Atlanta Braves win their first World Series since moving to Georgia. 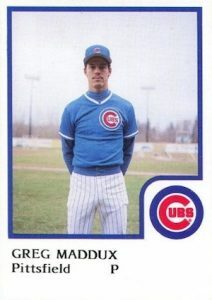 This top list of notable Greg Maddux baseball cards includes some of the most valuable releases from the late 1980s and early 1990s. Shop for Professionally Graded Greg Maddux cards on eBay. 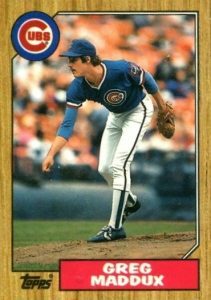 Maddux debuted with the Cubs in 1986 and, at the time, he was the youngest player in the majors. In 1988 he had his first All-Star season, winning 18 games, and he would win 15 or more games each season for the next 17 consecutive years, a major league record. While he was certainly an above-average pitcher up to that point, Greg Maddux took his performance to another level beginning in 1992. In that season, he won his first of four consecutive Cy Young awards, going 20-11 with a 2.18 ERA. The following season Maddux would join the Braves and continue his amazing streak. His best season overall was in 1995 when he went 19-2 and led the league in ERA, innings pitched, and complete games. Overall, he went 75-29 with a 1.98 ERA during those four Cy Young seasons. Showing he was not a one-trick pony, his amazing pitching control was only matched by his impressive fielding skills. Maddux amassed 18 Gold Gloves during his career, the most in baseball history. He also compiled 355 wins, placing him eighth all-time and he is the only pitcher with more than 300 wins and 3,000 strikeouts while having under 1,000 walks. There was no doubt Maddux was destined for Cooperstown, and he was elected to the Hall of Fame in 2014 on his first ballot. 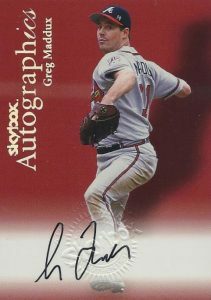 Beyond the cards listed in this top list, there are a few more Greg Maddux cards you may want to add to your collection. 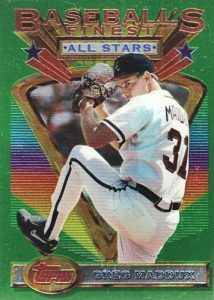 Maddux's first card with the Atlanta Braves came in 1993 Bowman and his final appearance as a player was in 2009 Topps while he was pitching with the Los Angeles Dodgers. 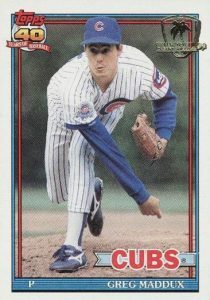 A minor league card featuring Maddux during his time with the Cubs' single-A team, the Peoria Chiefs, was issued in 1988. 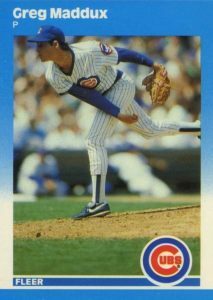 The card features Maddux's nickname — "Mad Dog" — that was given to him because of his intensity on the pitching mound. The set also features a combination card that Maddux shares with future Cubs stars Rafael Palmeiro and Mark Grace. Along with the autographs featured on the list, some other key Maddux signatures can be found in 1999 Upper Deck SP Signature Edition and 1997 Donruss Signature Series. Maddux incorrectly signed the 1997 Donruss cards as he added his signature on top of his photo rather than in the signature box located toward the bottom of the card. Fans of Greg Maddux are some of the most dedicated in the hobby, making his early and autographed cards some of the most valuable contemporary cards available. In building this list, card value is the key component coupled with card design and the set's overall importance. A rare first-year Maddux card is included in a food set created by Chicago-based polish sausage maker David Berg Hot Dogs. 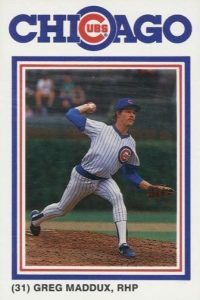 The cards were numbered using the player's uniform number (#31 for Maddux, which would end up being retired by both the Cubs and Braves) and Cubs collectors can also find fan favorites Ryne Sandberg and Andre Dawson included in the set. While his regular 1991 Topps card can be purchased for pennies, the foil stamp version for Maddux with a palm tree in the upper-right corner was originally made available to military personnel in the Desert Shield campaign as part of a special product. The limited release features some of the most valuable cards from the early 1990s. There were originally 6,800 sets produced but many of these boxes that made the trip to Kuwait did not make their way to the secondary market. One of the most common on-card autographs for Greg Maddux collectors could be found in 2000 SkyBox. His signed card was featured in the Autographics insert which includes a red background. The SkyBox autograph cards also feature an embossed seal to signify authenticity. As an early look at the upcoming 1996 Bowman's Best, an insert of preview cards were included in the main 1996 Bowman set. There were 30 preview cards, included at a rate of 1:12 packs, and lucky collectors could pull Refractor and Atomic Refractors at a more limited odds of 1:24 and 1:48 packs. The Atomic Refractors have become particularly popular with collectors, and this is one of the most valuable Maddux cards from the latter part of his career. Maddux made his Fleer debut in the Update release for 1987 Fleer. Looking to capitalize on the success of the Tiffany sets Topps had been issuing, Fleer began producing a glossy version of their standard set in 1987. They also gave the glossy treatment to Update and collectors look to the glossy set as the version that is most desirable when purchasing Maddux's Fleer rookie. The card collecting universe would never be the same after Topps introduced 1993 Topps Finest. Most notable among these cards, the ultra shiny Refractors, inserted into packs at an incredibly rare rate, created a level of demand that could not be met. Maddux's Finest Refractor can outpace even some of his certified autograph card prices. 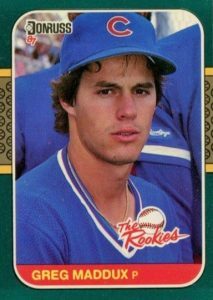 Greg Maddux was featured in both 1987 Donruss and the add-on Rookies box set. Both sets are nearly identical in design except that the Rookies cards have a green border rather than the black design in the main set. Maddux receives the Rated Rookie designation on his main card and, combined with The Rookies, Maddux's cards have developed into the two most valuable cards issued by Donruss in 1987. The earliest pre-rookie card featuring Maddux in the minor leagues can be found in the 1986 Procards set. It showcases Maddux during his time with the Pittsfield Cubs which was at the AA level. He posted a 4-3 record there before moving up to AAA where Maddux went 10-1 and quickly headed to the majors. This card has been faked many times, therefore, buyers should look for the slightly clipped font at the bottom of the "DD" letters in Maddux's last name to spot an authentic copy. Faked ones typically feature the full "D" letters. Outside of the standard 1996 Leaf Signature Series, more autographs were found in the Extended Autographs insert that featured superstars and the leading prospects with a much smaller print run. There you will find the first certified autograph card for Greg Maddux. It carries a print run of just 500 copies. His signature is one of the oddest in the majors and most collectors would have a hard time identifying even one letter of his name in his signature. 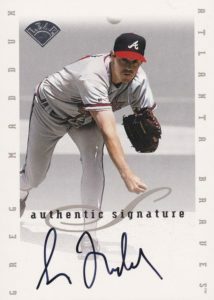 Maddux's brother Mike, who pitched for 15 seasons in the majors, also has an autographed card in the set, although it is not short-printed. 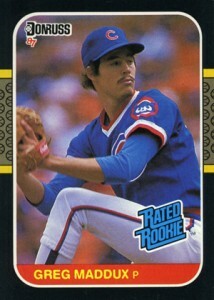 Greg Maddux made his Topps debut in 1987 Topps Traded and his appearance is the highlight of the 132-card update set. Gem-mint graded copies can top $40 at auction, which is quite the feat during the over-production era. To go along with the Tiffany set they created for the main release, Topps also issued Tiffany Traded, which is the must-have for Maddux collectors. Gem-mint copies of that card (30,000 Tiffany traded sets were created) reach prices three times as high as the regular base card. 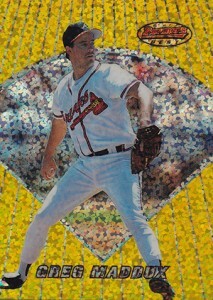 I have many Greg Maddux cards including the “Season Growns” see through # 5of10. Cannot find listed. 2017 Leaf Sports Heroes GREG MADDUX WAVE PRIZM REFRACTOR AUTO SP #8 10!! 2018 Immaculate Collection Plate Laundry Tag Auto 1 1 Greg Maddux CUBS!!!! 2014 Museum Collection Greg Maddux Archival Autograph Auto Sepia 1 5! 2014 Museum Collection Greg Maddux Archival Autograph Auto Gold 1 5! 2014 Museum Collection Greg Maddux Archival Autograph Auto Silver #8 10!